You may enjoy roasted pumpkin seeds for a snack, especially during the fall season. This crunchy food also provides a powerful nutritional punch, giving you a host of nutrients that may protect you from chronic disease. Pumpkin seeds have been used in traditional medicine for hundreds of years, but consume them in moderation. While there are benefits to this food, there are also some risks that may affect your health and the absorption of other key nutrients. Food poisoning is a preventable, yet common problem in the United States. Foods contaminated with pathogens or microbes may produce symptoms of nausea, vomiting, diarrhea and abdominal pain. Pumpkin is a sprout, and sprouts have been linked to food-borne illnesses, according to the Food and Drug Administration. The FDA will recall a product when any amount of an organism is discovered that can potentially poison an individual. A 2009 study in "Food Microbiology" tested various seeds and demonstrated that some pumpkin seeds contained E. Coli. The seeds were possibly contaminated when left out in the sun to dry or due to poor hand washing. According to the University of Nebraska-Lincoln, you may suffer an allergic reaction from eating pumpkin seeds. The allergy is typically caused by proteins found in the seeds. These proteins are not destroyed by heat, so even if you cook or bake pumpkin seeds, you can still show signs of a reaction. An allergic reaction can be mild or severe, and symptoms are typically seen within minutes to a few hours. You may experience digestive issues, hives or itchy skin, or respiratory problems. In severe cases, you can suffer from anaphylactic shock, a life-threatening condition for which you need to seek immediate medical attention. Anti-nutrients are substances found naturally in foods that decrease your digestion, absorption and use of other important nutrients. Pumpkin contains the anti-nutrients oxalate, tannins, cyanide and phytic acid. Tannins inhibit your absorption of vitamin B-12 and iron; oxalates do the same with calcium and magnesium, while phytic acid causes you to lose calcium and not absorb phosphorous. The level of anti-nutrients in pumpkin seeds varies depending upon growing, harvesting and processing techniques, but if you eat them in excess over time you can develop nutritional deficiencies. Pumpkin also contains the toxin cyanide, but the Agency for Toxic Substances reports that the amount of cyanide in plants in the United States is low. Pumpkin seeds are rich in manganese, magnesium, phosphorous, copper, protein, zinc and iron. These nutrients help protect your heart and bones. Soak your seeds to maintain the bioavailability of these nutrients and reduce anti-nutrients and toxins. Pumpkin seeds may also alleviate bladder problems, anxiety and arthritis. While there is a chance you can be allergic or exposed to food-borne illness, Drugs.com reports no indications of severe toxicity. 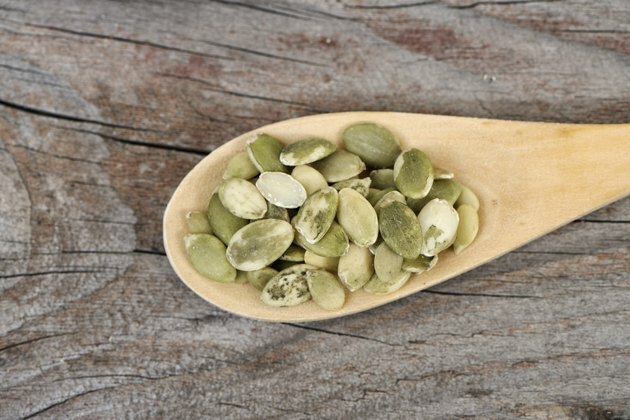 There is not enough information on the safety of pumpkin seeds in pregnant and lactating women, so consult with your doctor before eating them.